If I spray water in the fin tubes, does that help produce more cooling? This is a very bad idea, but it does achieve more cooling the first year. Then the year after, the supplementary water spray is ~25% less effective, by year three or four you’re back to where you started, but now you need to buy a new fin tube bank. It is very difficult to clean the water scale off of the fin tubesthat have had water sprayed on them. See figure 6 of the “Optimizing ACHE’s-Hydro Carbon Processing-Agius-2006” in the “Technical Paper” section of the web site. How do I solve hot air recirculation issues? Hot air recirculation is a big issue and frequently the end user has no idea they have this issue, as it is hard to detect. Many of the new SAGD plants in Alberta have this issue as the coolers are positioned very close to other tall structures and buildings or under pipe racks. Once you know you have hot air recirculation it is easy to fix. See the three technical papers in the “Technical paper” section of the web site. Can I upgrade from old “U” frame motors to new “T” frame motors? Yes, this is a great idea. U-frame motors were obsolete in the 50’s but the automotive industry was still using them so they were still available. That all changed a few years ago so now it is very cost effective to replace old U-frame motors with new high-efficiency, T-frame motors. We even have motor base adapters to convert from one bolt pattern to the other. Are VFD’s more efficient then auto variable pitch (AV) fans? We think VFD’s are more efficient, but pulling new wires in an older refinery is very costly, so to replace an old AVT fan with a new modern AVT fan is more cost effective, if you still require flow control. If you do not require flow control then consider converting your old AV fan into a standard (AP) fan. How do I adjust minimum and maximum fan blade pitch for an auto variable fan hub? We have a great YouTube video in the “YouTube” section of the web site that goes into this in great detail. Is there a better way to drive axial fans other than belts and gearboxes? Yes, see the new ABB-Baldor vertical motor in both the “Technical Paper” section and the “Brochure” section of the web site. We feel this new motor concept is the future for all axial fans. Are all fin tubes built the same? No, there are three main types of fin tubes. L-based wrap, Embedded and Extruded. 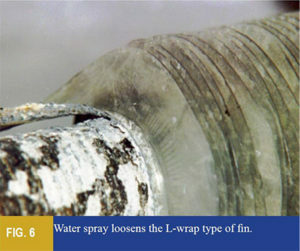 The lowest cost is the L-based wrap, but it degrades much quicker in service due to the wrap-on fin tube design. You need to fully understand the fin tube selection for your particular service. How do I manage winter pitch with colder heavier air? 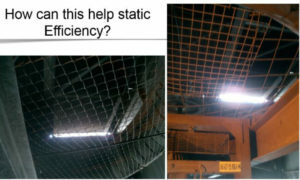 How does an airflow increase relate to actual net cooling benefit? This will depend on what sort of service you have. A good rule of thumb for condensing, liquid or vapor cooling is ½ the extra airflow to duty ratio. So a 10% increase in airflow will net ~5% better cooling duty. There is a good chart in the technical paper called “Optimizing ACHE’s-Hydro Carbon Processing-Agius-2006” in the “Technical Paper” section. How often should I lubricate fan shaft bearings? Fan shaft bearings do not run fast and the seal designs are such that they purge grease out, if over-greased. So it is hard to over-grease a fan shaft bearing. This is not the case for the electric motor bearings (which run much faster). So be sure to read our ACHE-Bearing Re-Lubrication Schedule” in the “Brochure/Installation Manual” section of the web site. How do I know if the fan bearings are designed correctly for my service? We can do a L10 life calculation for you. We also can help determine why your fan bearings have failed. Are inner “Seal Discs” important for a fans performance? Do holes and gaps in a fan box effect fan performance? Yes they do. Fan boxes need to be tight so the air flow is directed into and around the fin tubes for maximum cooling. If you have holes and gaps then the air escapes, which lowers the static efficiency of the system. A great example of this is in the very short YouTube video in the YouTube video section of the web site called “Air leaks out the top of CNRL-4C101”. These holes and gaps are easy to fix. Who performs the engineering for a fan HP upgrade? Any engineering house will be able to help, but frequently they lack the in-house experience so they contact the exchanger OEM. This is not the best way to approach this optimization opportunity. How large can I upgrade HP to for a belt driven ACHE? API suggests 60HP is the maximum for belt driven ACHE’s. It takes experience to engineer these upgrades. Here below is our standard disclaimer for larger HP projects. SUBJECT: Potential risks in regards to upsizing of fan drive motors in ACHE’s. It is common for many end users of air-cooled heat exchangers (ACHE’s) to upgrade the performance of their fans and motors to achieve higher airflow rates and more heat transfer. Many times the end user will replace the original motor with a higher horsepower motor that is the next NEMA frame size larger. Having more horsepower to drive the fan allows the end user to increase pitch of the blades further to achieve gains in airflow rate through the tube bundle. There is a slight risk that the end user will cause increased fan or motor vibration when upsizing the motor. The original ACHE was designed for the original motor HP. Increasing the HP may require additional mechanical support of the motor mount or attaching structure. It is normal for ACHE manufacturers to design different motor mounts depending on motor HP and NEMA frame size. Not all motor upgrades will have a vibration problem because of this change. Only a few applications could result in higher than normal vibration amplitudes at the motor, or structure. Many times, these troubled applications are fixed by small changes to the fan rpm, changing the number of blades or adding structural braces to stiffen the structure. It is advisable for end users to contact the original manufacturer of their ACHE for recommendations when upsizing motors. In the majority of cases the motor upgrade will require no changes. However, more aggressive motor upgrades may require a few changes to the existing unit structure or motor mount to achieve low vibration levels. Are there any power rebates for my area? Most provinces and states have some form of energy rebate (except Alberta). See the file in the “Case Studies” section of the web site from “Sacre-Davey Engineering”. They have listed provinces with rebate program opportunities. Will a high-efficiency fan save power? Absolutely, the best example of this is in the “Case Study” section of the web site. Read “Power Efficiency GainACHE Project-Special Cost Savings Feature”. BC Hydro awarded AltaGas a $1.3M energy credit due to using high efficiency fans. Will some fans move more air than others? Absolutely, this is the most misunderstood fact in the air cooler business. Not all fans are high-efficiency fans. We have tested pretty much every fan make over the past 30 years so we know what fan offers the best performance for your system. Will a fixed wing fan retrofit into where I currently have a flex-fan? Not always. One needs to pay special attention to the fan ring depth and the top fan bearing as the flex-fan will droop down. So many times the exchanger is built to suit the blade droop, whereas, the fixed wing fan will not droop. This is easy to figure out and we have developed a great data sheet to help solve this. We have also developed many great low cost strategies for projects like this. Are fixed wing fans (like Hudson Tuf-Lite, Checo or Aerovent) more difficult to set up then flex-fans (like Cofimco or Moore)? Yes, you need to pay more attention to the fixed wing fan. You need to make sure you set tracking as per the fan manual and also keep the blade pitches within .2 °. If you go to the “Technical Paper” section of the web site there is a great paper on this called “Technical Paper-Fan Vibration Fixed Wing Fans-Norgren-Agius-2012”, see page 2 of this paper and hand this page to your installer. Can I upgrade older HTD timing belts to the new Gates Poly Chain belts? Yes, if the larger fan pulley is 14MM pitch and in good shape, we can save you the cost of buying a new larger fan pulley. The small motor pulley needs to be upgraded to a new Poly Chain pulley and the belt needs to be a new style Poly Chain belt. Keep in mind that the new Poly Chain will be less than ½ the old HTD width, so if you can push your motor pulley closer to your motor bearing we can reduce the motor bearing load at the same time. Are timing belts better than V-belts for axial fans? Yes, the timing belts will transmit power at 98% efficiency, whereas V-belts slip. Any speed loss has a direct linear effect on airflow. So 10% slip is a 10% loss in airflow. How do I align and tension belt drives? One needs to know two things to properly tension any belt. The distance of deflection and the force to deflect. One should never guess especially with the modern Poly Chain timing belts. One also needs the proper tools. We have developed a great pdf file for this whole process with a few tricks that work great. See the tab “Belt-ACHE’sInstallation Tips” in the “Brochure” section of the web site. If I have a VFD, are there any bad speeds I need to block to avoid resonance frequency (RF) issue? This depends on the style of fan. A fixed wing fan is more susceptible to this condition so yes, you need to check and block any bad speeds. A flex-fan is less susceptible, but that doesn’t mean it will never happen. Each fan program has the ability to warn you if you are getting too close to a RF issue. One needs to know how to work the software as well as the API rules. The process for blocking the bad speeds is easy. Is there a test to indicate when to clean fin tubes? We have developed a very good strategy for simple testing to show when the fin tubes need to be cleaned. If you have an OEM cooler specification sheet then you know the static pressure that the system was built to. Then we need to log what the actual system pressure is with any upgrades or changes since new. Did we change the speed or fan blade pitch as that changes static pressure? Once we have the fans running 100% and we know the expected static pressure then we have our base line. We would test with a simple manometer and test all four corners of the fan box. We would maybe need to drill a small hole in each corner to test. Then every year we can test the same bank at the same pressure point to develop data so we then would know when we need to clean the fin tubes based on static pressure readings. How often should fin tubes be cleaned? The short answer is yearly as a minimum standard. Where do I set the digital level to read the blade pitch? Every fan is a bit different so you need to know what fan you have. There is an excellent manual in the “Technical Paper” section that shows where to take the blade pitch reading for most every fan on the market. It is called “Where to take fan blade pitch readings-HenryRichards”. If Tip clearance is more than API how do I rectify this issue? Install Tip Seal. Tip Seal kits come complete with all the parts to secure them to the fan ring. They are easy to add and they help reduce airflow losses at the tips where the fan speed is highest. What is the best tip clearance for axial fans? There is an API chart in the “Optimizing ACHE’s-Hydro Carbon ProcessingAgius-2006” in the “Technical Paper” section of the web site. It depends on the size of the fan. For most ACHE’s think ¼” to ½” up to 9ft, then ¼” to ¾” up to 16ft. For larger cooling towers think ¼” to 1”. How do Inlet Bells help my fan system? Inlet bells are easy to add and they do two things. They help speed airflow through the fan ring, which adds ~ 3% ACFM. They also lower fan noise slightly. If I do not have an OEM cooler specification sheet, how do I know what fan pitch to run a fan? It is not easy to calculate this if you do not have enough experience. What is the difference between SPL and PWL for noise? Noise can be confusing at times, especially when discussing sound power levels (PWL) and sound pressure levels (SPL). SPL is the amount of sound energy that is heard by the human ear or a microphone. It is possible to approximate the difference between SPL and PWL. For example, let's say that a fan has a PWL of 105 dBA. At 1 meter below this fan, you would hear an SPL of 88.5 dBA. SPL readings at 1 meter below the fan are generally 15 to 18 dBA lower than the PWL. Sound pressure levels will decrease rapidly as you get farther and farther away from the fan. What is considered too loud for fan noise at my facility? Often we are looking at a SPL fan noise, at 1 meter, to be in the mid 80’s dBA. This noise level is considered to be responsible to our neighbours nearby. Some new projects that are closer to residential houses are much stricter for noise. How do I lower fan noise? Fan noise can be reduced by using low-noise fans and running them at a slower speed. Usually the low-noise fans are wider so they can maintain static efficiency at lower speeds. Higher tip speed is what creates noise so lowering fan noise starts by lowering speeds. Also, Inlet bells help lower fan noise and increase fan performance. Another great way to lower fan noise is by adding VFD’s to the bank. There are a couple of good technical papers on lowering fan noise in the “Technical Paper” section of the web site. How do I know what the optimal blade pitch is for an axial fan? 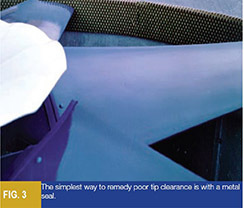 The best way to set optimum fan blade pitch is to not use amp draw alone. You need to have a fan curve and also, know how to read the fan curve. How do I know when a fan is in “Stall”? Fan stall is easy to hear if you place your ear up close to the bottom fan guard. If you hear fluttering this could be stall or a dirty fin tube bundle. Usually setting fan blade pitch by amp draw without a fan curve will get you into a stalled condition. Knowing how to read a fan curve will help show when you’re close to a stalled condition. Fans windmill due to the way fan bays are built. Two or three fans usually share the same common fin tube bundle, so when one is shut off the other is running and drawing air back down over the fan, which causes it to spin backwards. This is very hard on the equipment once it gets the signal to run forward again, especially if you have a gearbox or timing belt drive. See the two short YouTube videos in “About us” section of the web site. How do I stop a fan from windmilling? Usually someone tries to use a 2x4 or broom handle to stop a wind-milling fan. This is dangerous and should be avoided by having an anti-rotation device (ARD) installed. How do I know what the best fan tip speed is for a fan? What is too slow or too fast? The best fan speed is found by using the software for the fan in service. You require an OEM specification sheet as well as the skills to load the proper information into the software program. API suggests no higher than 12,000 FPM. The easiest way to stay away from stall is to run fans closer to 12,000 FPM but if noise is a concern you need to take that into account. How do I fix fan vibration issues? Fan vibration can be difficult to fix as there are so many reasons for system vibration. First we need to establish what fan you have and then come up with a solution. We also need to know if the fan vibration is at fan, motor or blade pass frequency. If you go to the “Technical Paper” section of the web site there is a technical paper on this subject called “Technical Paper-Fan Vibration Fixed Wing Fans-Norgren-Agius-2012”. How do I test axial fans for best performance? There are a few ways to approach this. If you want to test for airflow and static pressure you can hire a contractor or you can test yourself. We have a detailed video in the “YouTube” section of the web site that shows you how to test on your own. Also, keep in mind this is not considered a full performance test. To test performance you need to also log input and output temperature and pressure. As you can imagine this is very difficult to collect exit temperature on a larger fan bank. To avoid this extra cost you can perform a simple airflow test in combination with a skilled operator on the panel. 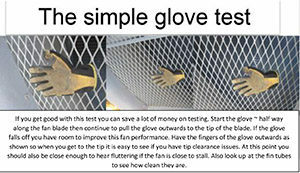 One last simple idea to avoid the cost for airflow testing is to use your work glove. Yes, if your work glove will not stay stuck to the bottom fan guard (for an FD fan) then there is something wrong with your system.